them under the midnight sun. Photo: Jason O'Hara. 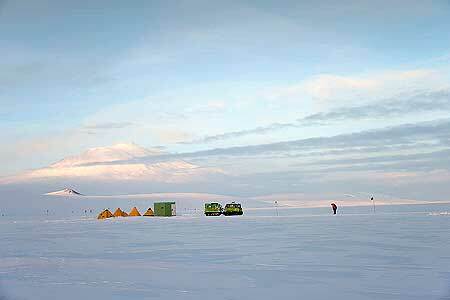 Massey University colleagues, Jason O'Hara and Warren Maxwell won't be the last people to be awe-struck by the immensity and beauty of Antarctica. They believe their October trip to the white continent has produced material for individual projects and collaborations for years to come . This isn't the first time that Mr O'Hara, a self-proclaimed science and documentary geek from the School of Design, has used his design and artistic skills to communicate the environmental realities of remote and fragile lands. His 2011 trip to the Kermadec Islands with eight of New Zealand’s leading artists resulted in an exhibition Kermadec: Lines in the Ocean, seen in 20 venues around New Zealand and the Pacific over the past five years. The Antarctica trip made him become even more aware of the disconnect between people and nature, he says. "The facade of civilisation makes people feel that nature is 'over there' and therefore the issues of nature like climate change are 'over there' as well. There is a perception that scientists and governments will fix climate change when in fact we have a collective responsibility. "I don't think there is a gap there at all in Antarctica. There is just a thin green line- a giant fridge door- between you and an environment that could kill you if you aren’t prepared. You never forget that nature is in charge," he says. While Mr O'Hara has wanted to visit Antarctica since he was a young child and would return in a 'heartbeat', Mr Maxwell from the School of Music and Creative Media Production said he never had a desire to visit: "But now I am addicted to the place. It is the purest place you can imagine. I sincerely feel that Jason and I have become part of the place and have become kaitiaki [guardians]," he says. Mr O’Hara says their project #60shadesofwhite aims to connect new audiences with Antarctica and its science by allowing them to experience life and work through the eyes of the scientists, explorers and personnel at Scott Base. "The ability to combine other media enriches the story even more. There will be a bunch of outputs from photograph exhibitions, video and music, and I am getting excited about what we can do together." An album inspired by the trip is already on the cards for Mr Maxwell and he is talking to colleagues in the music industry about a composition challenge for young people using the sounds of Antarctica, such as a recording made of Weddell seals. He hopes that future projects will be the antithesis of hype. "We are all caught up in this crazy manic world and have a culture of trying to produce as much output in a day as we can possibly squeeze in. I hope we can reflect on the meditative, spiritual aspect of life that we experienced in Antarctica. Down there, the general ethos seems to be 'let's just do a few things well – and stay safe," Mr Maxwell says. While they were on the ice, a close friend of the New Zealand Antarctic community passed away after a short battle with cancer, and Professor Gordon Hamilton, a prominent climate scientist working with the US Antarctic Programme, was killed when the snowmobile he was riding plunged into a 30 metres deep crevasse. It was a sombre time for many on the ice and Mr Maxwell (Trinity Roots, Little Bushman, ex-Fat Freddy's Drop) was pleased to play a set of music to support the locals. The two colleagues hope the trip to Antarctica will be the start of a collaboration resulting in an augmented reality work, featuring music, narration and video projections. This will create experiences the audience can be immersed in such as viewing auroras, diving under the ice and learning about the icy continent’s mysteries. They will be seeking funding for their Antarctica projects. "The convergence of a range of media is very exciting and can change the way we can tell stories. I am sure that we will push each other out of our comfort zones," Mr O'Hara says. "Music and sound is intangible- people create the visual from the sound. Jason and I are coming at the same objective from different perspectives. Our aim is to get people connected with Antarctica without them having to go there," Mr Maxwell says. 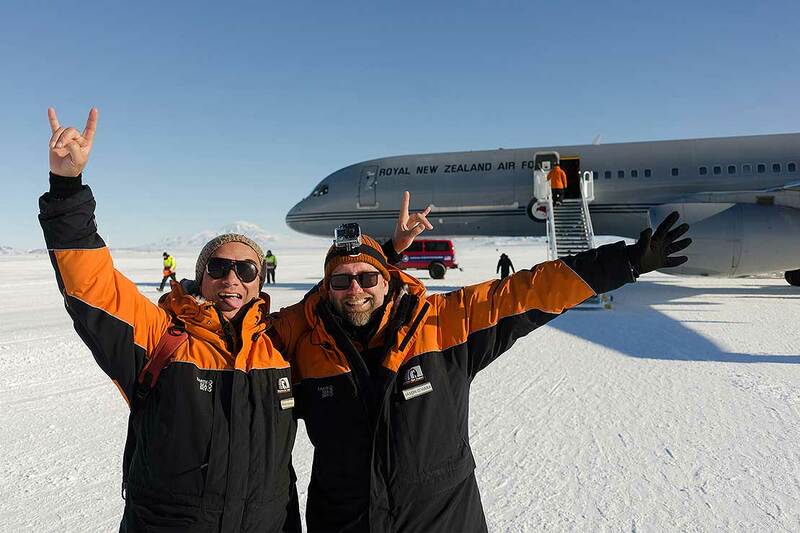 The two men from Massey’s College of Creative Arts spent nine days at Scott Base in October as part of Antarctica New Zealand’s Community Engagement programme. Click here to see some highlights of the trip.